Elon is coming off of what is arguably the biggest win in school history when they defeated James Madison on a last minute touchdown pass from Davis Cheek to Avery Jones. The Phoenix defense also shut down the Dukes running game, holding them to just 103 yards on 40 attempts. The Phoenix also had 40 rushing attempts but ran for 212 yards. The Phoenix were led by Malcolm Summers who ran for 186 yards on 20 carries including a 59 yard touchdown run. Elon was able to break a number of big plays in their win. The Phoenix come into this week 4-1 with only a loss against a ranked FBS South Florida team blemishing their record. Behind Cheek and Summers on offense and a well above average defense, the Phoenix look like a team that can beat anyone in the FCS this year. Key Player: QB Davis Cheek is only a sophomore but plays like a senior. Cheek has only thrown two interceptions and is completing 66% of his passes. Cheek always makes a smart decision with the ball and while he only completed half of his passes against James Madison, he didn’t throw into the teeth of the ball hawking Dukes defense and was able to keep the Phoenix moving down the field. Cheek also hit the big play a couple times when needed, usually targeting Corey Joyner. Cheek will have to be just as efficient against a good Delaware defense. Fantasy Bonus Baby: RB Malcolm Summers is the best back in the CAA. He rarely loses yardage on a carry and seems to pick up a big first down whenever the team needs it. Summers has run for 626 yards and three touchdowns already this season, averaging just under 120 yards per game. Summers has big play potential and can break a big run at any time. Expect him to break at least one big play and score at least one touchdown to go with 130 plus yards on the ground. Delaware is 1-1 early in its CAA schedule with shocking loss (at the time) to Rhode Island and an easy win in Coach Danny Rocco’s old stomping ground at Richmond. 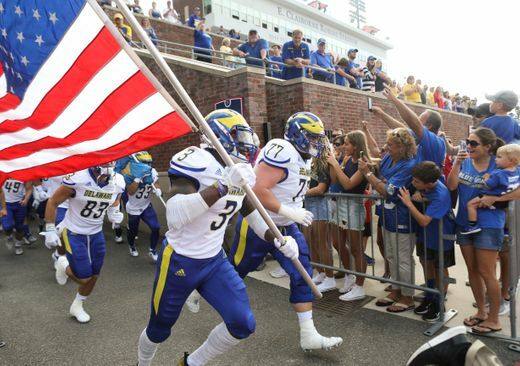 The Blue Hens struggled early in a 38-10 loss at top ranked North Dakota State, but was able to shut the Bison out for the last 34 minutes of the game. Delaware wins games with a strong defense led by Penn State transfer Troy Reeder. On offense, the Blue Hens are going to have to run the ball more effectively to be successful. Quarterback Pat Kehoe has been ok to start the year, but is only completing 51.6% of his passes. Kehoe has thrown for eight touchdowns and has thrown three interceptions, all against North Dakota State. have a big game for Elon running the ball. Reeder is a special player who already has 48 tackles so far this season in five games. He has a nose for the ball and is always around the play. If Reeder and the rest of the Blue Hens defense can control the line of scrimmage against Elon they will have a much better chance at success. Fantasy Bonus Baby: WR Joe Walker started his Delaware career as a dual threat quarterback before moving to receiver this year. Walker is a dynamic play who can do anything asked of him on the offensive side of the ball. He is the team’s leading receiver with 15 catches for 353 yards and two touchdowns so far this year. Walker should have a decent game receiving, but there is no better time for the Blue Hens to dig into their bag of trick plays and get Walker even more involved. Fearless Prediction: This is a classic letdown trap game for an Elon team coming off of a huge win last week. Delaware will be desperate to get a signature home win to set themselves up for the back half of the season. This is the upset of the week. Delaware 27, Elon 23.